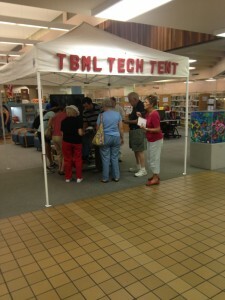 The Thomas Branigan Library sets up its Tech Tent each Wednesday for an hour to answer patrons’ technology questions. Since September 2014, customers at Thomas Branigan Memorial Library in Las Cruces have been getting help using their e-readers, smart phones and tablets at the Library in a weekly Tech Tent. Branigan Library offers its users a wide range of e-services, and all of them are supported by the Tech Tent. Its e-book collection features items from the 3M Cloud Library, Freading, and OneClickdigital. In addition, there is downloadable and streamable music with Freegal as well as online magazines from Zinio. Branigan Library is located at 200 E. Picacho Ave. in Las Cruces and is open 64 hours per week. Hours are Sunday (closed Memorial Day weekend through Labor Day weekend) 1 pm to 5pm; Monday – Thursday 9 am – 8 pm; Friday and Saturday 10 am – 6 pm. For more information: rfrankel@las-cruces.org or 575-528-4000, or http://library.las-cruces.org.